The idea that ‘Virtual Reality is the new frontier in games’ is already looking a bit tired. Now that the initial hype has died down and the first wave of headsets and VR games has reached early adopters, it feels high time that the medium evolves beyond its ‘exhibition’ stage – defined by impressive but myopic games that I find difficult to sit through for more than 15 minutes before I’m queasily and desperately clawing my way back towards actual reality. If VR games are your bag, we’ve got a lovely list of the best virtual reality experiences out there. The Assembly breaks that mold. It’s the first VR game I’ve played that feels like something I can sit down with for an hour or more at a time, thanks in equal parts to an intriguing story, lovely world detail, and gamepad controls that ingeniously solve many of the long-standing problems with medium. 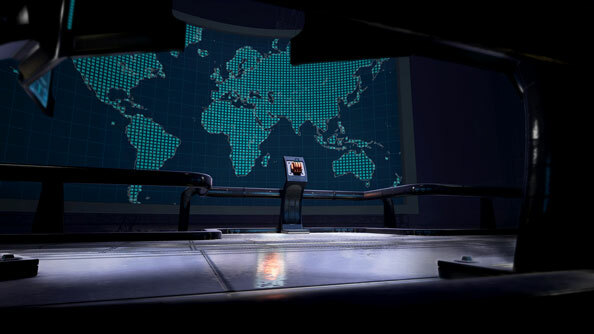 In my hands-on, I played around half – two hours – of The Assembly’s story, which is split between two protagonists: Madeleine Stone, a former employee of the titular research lab who is forced to become a guinea pig in its experiments, and Caleb Pearson, a current employee trying to figure out why he’s been kept in the dark about a secretive project the Assembly is working on. In gameplay, this translates to a first-person exploration and puzzle game, with no combat and a slow, deliberate pace that complements the story, gameplay, and sound design. ‘Snap’ is an option that replaces turning the camera via the right analog stick with instantly pointing you in the direction you tilt the stick (making it sometimes feel like a modern-day Myst). 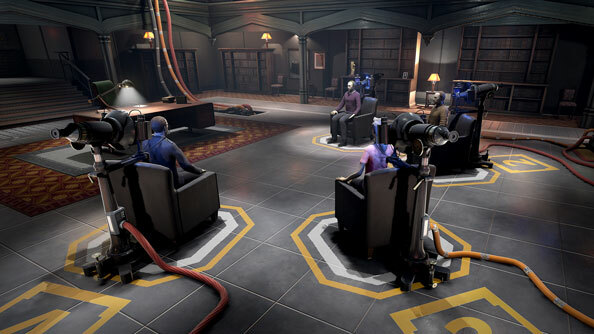 ‘Blink’, meanwhile, is something you’ll be familiar with if you’ve played Dishonored – by holding the left trigger, you can move a projection or ‘ghost’ of yourself anywhere around the room, then teleport (well, run at 100-200 metres/second, I’m told by the game’s code manager Richard Fabian) to that location. These features are a great solution to VR sickness, and I quickly develop a means of getting around (no strafing, slow walking, snap-turning) tailored to my personal VR thresholds. It not only feels comfortable, but the best way of engaging with a game that’s happy for you to take your time. Snooping around as Caleb, I quickly discover that the Assembly is an institution unafraid to break a few eggs in the name of the scientific and proverbial omelette, letting biological nasties out into the wild to monitor their effects on nature. I gather information from going through drawers, hacking computers, and examining toothy, alien-looking cells through a microscope. There are a few puzzles to solve too – small riddles set up to conceal password information on keypads and so on – though none will leave you staring vacantly at the screen for hours à la The Witness, as the game focuses on gently pushing you through the story. The sinister undertones of the plot don’t carry over too much into the atmosphere, which feels almost meditative thanks to bright, clean visuals, and a cleverly designed soundtrack by audio director Matt Simmonds. 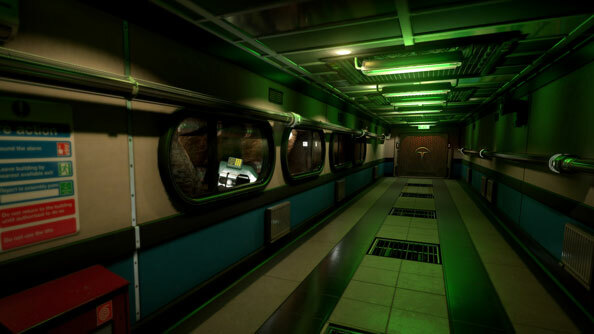 “With a narrative VR game like this,” he explains, “you have a lot more time to be located in the environments, which means that from an audio perspective you need to add a lot more detail. Some sounds you need to pan out for two, three minutes or even longer because you’re going to spend a while in that place”. This is evident in the gentle, melodic piano score through much of the game, which feels like it’s ambling alongside you as you play. But Simmonds also points out that there are little acoustic details unique to VR. 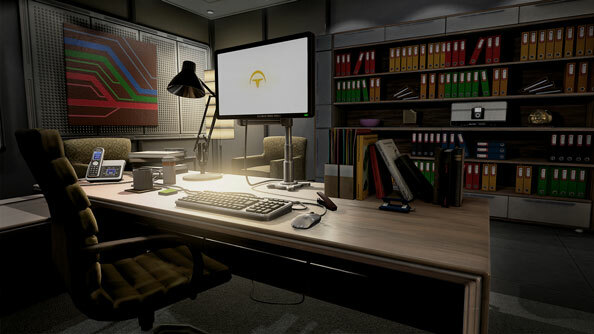 Leaning down towards a computer in the game, for example, you can hear the hard drive running. Lean in a little further, and you can even hear the buzz of the monitor. Later in the game, a rickety elevator causes glasses and flasks to shake and jingle in a cabinet in a far corner of the room – again, the closer you lean, the more you hear. These are small details, sure, but also hint at the vast possibilities for sound design with VR. The Assembly will be coming to non-VR (or ‘flat’, as I like to call it) platforms too, but Simmonds and his fellow devs admit that much of the immersive magic that comes with VR-tailored 3D sound will be absent. The Assembly is built around the technology and thrives in those VR idiosyncrasies, but the ease of also releasing it as a flat game (a “trillion times easier” than the other way round, apparently) and making it available to a wider audience means that they’ve little to lose in doing so, and may even whet people’s appetites for the VR version. Back in the game, I play as human guinea pig Maddie, taking on undoubtedly the most intriguing puzzle in my hands-on, where a gathering of dummies is sitting around a dining table, with one of them having been murdered. The sequence starts off creepy, as the entire room is dark except for the sanguine table in the middle, the silhouettes of the dummies lurking. It’s a short but notable moment of unease, but then the lights come up and a gentle background piano melody kicks in. The puzzle has started, and I need to figure out which two dinner guests are responsible for the murder by listening to audio interviews and inspecting the evidence in the small sets (a classroom, a locker room, a property magnate’s office, etc) around the sides of the room. The tone of the whole sequence is brilliantly executed, showing that nDreams are sensitive to the fact that the VR headset comes pre-packed with a fair share of oppressiveness, and able to balance the atmosphere so it never exacerbates that feeling. The contrast between the prescribed puzzles and synthetic environments in which you play as Maddy, and the more exploratory gameplay of Caleb works nicely, though in the case of the latter there were moments where I had to backtrack because I failed to notice a drawer, a computer, or a petri-dish tucked away in some corner of a vast lab complex. In terms of navigation, you can use the Blink ghost to scan rooms and get an idea of what you can interact with, or look at the maps pinned up in the corridors. You won’t find any semblance of interfaces, menus and automaps here. It’s a trade-off, for sure, but with a game that focuses on immersion, getting a little lost occasionally is more desirable than having your hand held. 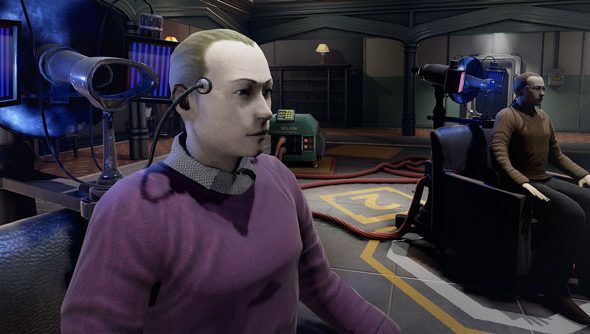 The Assembly has a good chance of being among the first standout VR titles – one that feels far more substantial than a tech demo while avoiding the nauseating pitfalls of similarly ambitious games. That doesn’t necessarily mean that it’ll be one of the greatest games ever released on VR – the future of the medium remains wonderfully mysterious – but it’s certainly stepping into more substantial gaming territory, and I wouldn’t be surprised to see its various little mechanical and design tricks taken on by other developers. The Assembly goes beyond superficial thrills and gives a glimpse of how fully-fleshed games on VR – using the ever-problematic gamepad – may actually function in the future. You can criticise the slightly bland inner monologues of the characters and the routine exploratory gameplay, but these are small gripes in an experience where the story, sound and mechanics collude to make this game far more than just another VR gimmick.